Finding work is a top concern for freelancers. In fact, a whole host of income-related issues are troubling today’s freelancers, who worry about the competitive nature of the business, if they’re being paid fairly, and where they’ll find their next writing job. Pitching is an important tool in combating such concerns. If you’re a freelancer who’s trying to drum up work, pitching should be one of the top tactics you use (well, once you polish your writing portfolio). Pitching is hard. Pitching takes time. Pitching is a lot of work for something that might not pay off. Overwhelmingly, the writing jobs that pay well materialize from the kind of interpersonal, back-and-forth communication that pitching facilitates. No brand is putting a $500 writing assignment on Fiverr. To get the jobs that pay the big bucks, you have to sink some effort into it. When it does work out, it can be the beginning of a profitable and long-standing relationship. You only need to hit pay dirt once or twice to generate true income stability with big-budget clients who need content over the long haul. Making a career out of freelance writing isn’t a fool’s errand. You can make serious bank. So how do you go about it? Just start sending emails to any old random editor you find on a publication’s “About Us” page? No, it’s a lot more involved than that. There are several types of pitching, each with its own pros, cons, nuances and best practices. 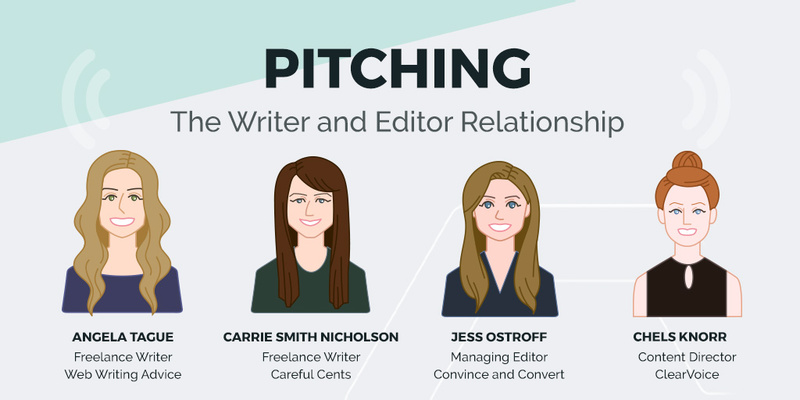 This guide walks you through the types of pitching out there and how to do each one. 1. You’ve found the best person to pitch to. If you don’t know this ahead of time, you’ll have to do a little research. Go to their site or blog and look for a “Write for Us” or “Contributor Guidelines” link. If you can’t find the right contact person that way, visit the publication’s “About Us” or “Our Team” page. You’re looking for someone with the title blog manager, managing editor, content strategist, or someone in marketing. Freelance writer Kelsey Jones suggests using a tool like Email Hunter to find correct contact information. “I see a lot higher conversion rate when I know the editor’s or recruiter’s name, so I can put that in my email versus ‘Dear Editor’ or ‘Dear Hiring Manager,'” Jones says. 2. You have a great subject line. If your subject line is lame, they’re not going to read your email, period. There’s no rubber-stamp subject line that will work well across the board, however — too much depends on the details of the industry and the specific topic. Check out this HubSpot post for some general guidelines on crafting good sales email subject lines (because you are selling yourself, after all). Do not write one generic email and send it out en masse to a bunch of email addresses you plugged into the BCC field. Known as “shotgun pitching,” this method rarely works. Ditto swapping out the recipient’s first name in the greeting followed by that same pasted-in generic email. Tailor your pitch to the pub’s needs. Make sure your topic aligns with the brand’s vision and mission. Show them that you did some homework. Find a compelling angle and say why it would be of particular interest to them. Mention their needs and how you can help meet them. Be explicit; you can provide value because of X, Y and Z. 4. You toot your own horn. Establish credibility, especially if the publication has never worked with you before. Include a few links to relevant pieces of content you’ve written. Name a couple high-profile pubs that have published your work. Include your Twitter or LinkedIn profile (only if they’re built-out; better to send no social profiles than weak ones). Of all the types of pitching, this one is the biggest crap-shoot, because you don’t have a lot of information to work with. The publication doesn’t have a public submission policy on their website, nor do you have a contact there. Identify specific publications you wish to write for. You likely already have an idea of who the leaders are in your niche, but a simple Google search for “best blogs about X” will narrow it down. For each pub you want to target, spend some time researching their existing content. Which topics have they already written about? Which ones are they lacking? Where might you be able to help fill the gaps? Use this information to formulate ideas for content. Competition among writers is less intense in cold pitching, because there are no guidelines or deadlines to drive submissions. But on the flip side, your chances of sending a pitch to them and just never hearing back are high too, because this type of pub is the least interested in hearing from writers (or else they’d have submission guidelines on their site, right?). Also, be aware that some publications and clients do not accept unsolicited pitches or submissions due to legal concerns around intellectual property rights. In your pitch, you should: Invite them to make tweaks to your idea, so it will better suit their needs. You want to demonstrate that you’re flexible and easy to work with. Casual pitching is similar to cold pitching, except that the publication openly accepts submissions. You will find a set of guidelines to follow on their site along with instructions on where to send your pitch. Whereas a cold pitch is what you send when you’ve never worked with a pub before, you may have previously worked with the publication in casual pitching. In your pitch, you should: Follow their submission guidelines. If they’ve taken the time to post what they want included in a pitch, you need to abide by those guidelines, lest you annoy the person on the receiving end. The publication actively wants you to either a) submit pitches on a specific topic or set of topics, or b) tell them why you’d be the best writer for a particular assignment. They maintain an open request for pitches and may even set deadlines for them. Competition among writers is more intense at this level of pitching, as everybody being considered for the assignment is usually highly qualified and interested in the topic. In your pitch, you should: 1) Convey your expertise and 2) explain the angle you plan on taking with one or two specific points. This pitch focuses less on what you will write and more on whom you know and how you will leverage those relationships to meet a pub’s needs. Perhaps the publication has an idea that requires a subject matter expert, celebrity or CEO; or maybe they’ve already made contact with that SME or VIP, and you need to demonstrate that you’re experienced and professional enough to interview such a high-profile person. In your pitch, you should: Demonstrate that you have the public relations skills to secure the requisite SME or VIP. If you already have someone in mind, use that relationship as the angle for your pitch. In your pitch, you should: Offer your unique take on the subject matter and give them stand-out ideas. Competition among writers is usually limited to a small pool in these types of pitches, and run-of-the-mill ideas won’t cut it. You’re seeking to write for a publication that is an authority in a specific industry. There’s often no pay attached to this type of writing; you want to write for them because they are leaders in the field, and you want your name to be associated with them. The publication already has a vetted pool of content contributors who regularly vie to be in there. The relationship is mutually beneficial — they get (usually free) content produced just for them, and you get a byline, a link to your personal website, and the professional glory of being associated with them. In your pitch, you should: Show some serious social proof up high in the pitch. These pubs get pitched all week long, and you’ll have to establish some street cred with them almost immediately. If you are a SME with a significant social following and you want to leverage this public sway as part of your pitch, then this final category of pitching applies to you. Influencer pitching is (duh) all about your influence on a target audience, and the client or company you’re pitching will want to know which social channels you’re active on and how many followers you have there. This kind of pitching usually necessitates a custom contract to establish expectations of promotion. In your pitch, you should: Promise to promote the content via your own social/promotional channels and include data about your followings on such channels. Anything worthwhile is bound to have a few speed bumps, and pitching is no exception. If/when your pitch is declined: That’s OK. Look for opportunities to repurpose that pitch for a different pub and try again. If the same pitch continues to get declined at pub after pub, you may wish to retire it, however. It’s obviously not resonating. The follow-up: Wait a week for them to get back to you. If you don’t hear back within seven days, send a short follow-up email. But don’t be a pest: You may wish to follow up a second time, but certainly no more than that. No one likes to think that a pub might steal someone’s expression of an idea, but it happens. Now ideas, for the most part, are not protected under copyright law. Anyone can come up with an idea to create, say, a guide to pitching. However, the expression of such an idea is subject to copyright law, and the execution of an idea always has more value than the idea itself. To protect your ideas, don’t include too many details in your pitch, unless you’ve been paid to do an outline. You want to provide enough detail so the publication knows you’ll be able to execute your ideas well, but you don’t want to show all your legwork upfront. If they want the legwork, they need to hire you. A word about working on spec. While working on spec isn’t illegal and copyright infringement is, be wary of publications who want access to your final drafts with no agreement on the books. Be careful of simultaneously pitching similar ideas to different clients. You might want to ask a client if simultaneous pitches are OK.
As mentioned above, don’t blast out a templated, impersonal pitch to a large number of potential clients. The practice rarely works, and it reflects poorly on you. Always use the same journalistic standards in your pitches that you would in your writing. Use good grammar, cite primary sources, be original and transparent, etc. Remember, people are more connected today. That editor you pitched at a magazine might know that director of marketing at that agency you also pitched. Be professional at every point of contact. Final word: Passion is good. Carrie Smith Nicholson (@carefulcents)of Careful Cents, Angela Tague (@AngelaTague) of Web Writing Advice, Jess Ostroff (@jessostroff )of Convince and Convert and Chels Knorr (@ChelsKnorr) of ClearVoice talk do’s and don’ts of pitching from the writer and editor perspective.